Although hard work remains following defeat of the Islamic State of Iraq and Syria’s tyrannical self-proclaimed caliphate in Iraq and Syria, there are encouraging signs that life is returning to normal, the spokesman for Combined Joint Task Force Operation Inherent Resolve told Pentagon reporters today. On March 21, various groups across Iraq and Syria -- including Assyrians, Yezidis and Kurds -- celebrated Nowruz, the beginning of the Persian new year, free from ISIS, for the first time in years, Army Col. Ryan S. Dillon said from Baghdad. “In Mosul, the United Arab Emirates -- a valued partner in the coalition -- pledged to assist Iraq in reconstructing the Nuri Mosque and the Hadba minaret, which ISIS destroyed as it withdrew further into the city in June of last year,” Dillon said. Iraqi security forces continue to provide the security that enables stability necessary for rebuilding and reconstruction, he added, noting that the U.S.-led coalition will continue to conduct operations that limit ISIS’ freedom of movement and constrain their ability to build forces. In Syria in over the past week, the coalition conducted 14 strikes against ISIS terrorist fighters and defensive fighting positions. Additionally, the Syrian Democratic Forces recently announced the capture of Mohammed Haydar Zammar, a Syrian-born German national who worked as an ISIS recruiter, the spokesman noted. 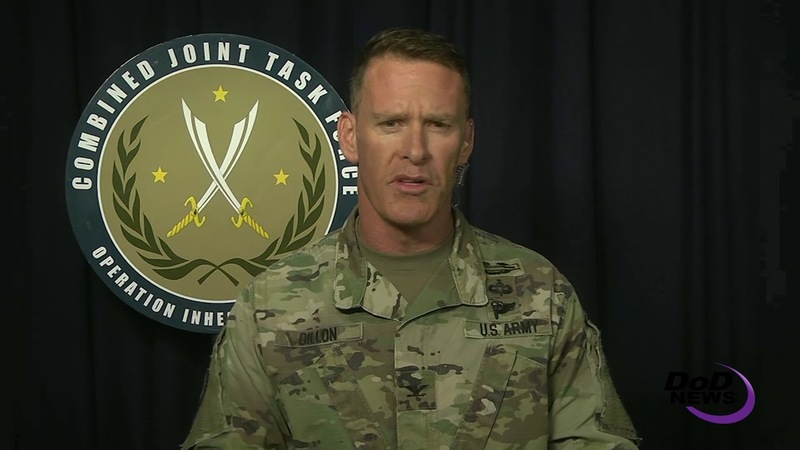 “The Syrian Democratic Forces continue to prove they are a capable force, defeating ISIS throughout most of north and eastern Syria, but also detaining hundreds of foreign terrorist fighters,” Dillon said. Terrorist fighters in the region are attempting to sneak away to establish new safe havens or return to their home countries to recruit, plot and execute attacks, he said, adding that these terrorists’ tradecraft, passports and relationships represent a global threat to the civilized world. “The SDF are denying ISIS the ability to do this,” Dillon said. Also denying ISIS the ability to come back to liberated areas, the Raqqa Internal Security Forces continue to grow, improve and provide Raqqawis with security, he noted. The U.S.-led coalition has trained many of the security forces on the law of armed conflict, weapons familiarization, first aid and awareness of techniques to counter improvised explosive devices. The security forces are subordinate to the Raqqa Civil Council, a local body that is representative of Raqqawis and responsive to their needs, Dillon explained, adding that April 19 marked the first anniversary of the council’s formation. The RCC has been instrumental in instituting stabilization projects to bring life back to Raqqa after the defeat of ISIS, he said. One such initiative is the restoration of the region's canal system, restoring water to tens of thousands of northeast Syrians. 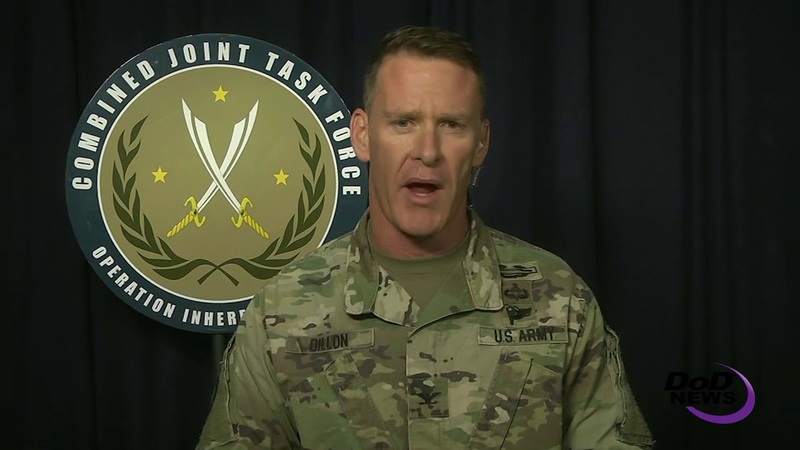 Army Col. Ryan S. Dillon, spokesman for Combined Joint Task Force Operation Inherent Resolve, updates Pentagon reporters via satellite on progress in the effort to defeat the Islamic State of Iraq and Syria, April 24, 2018.